Write your name and address on the label of your recycling container after it arrives. Lightly rinse all cans, bottles and other containers to remove food and other contaminating substances, being sure to remove all lids from plastic and glass bottles and jars. Separate your paper products from all other materials by using a paper bag or bundle them with twine to prevent mixing (see photo at right). Place your full recycling container next to your trash cans on garbage day. Pat yourself on the back for doing your part to help save our environment! While these five steps might seem almost too simple to be true, this is all you have to do to participate in the Canton Curbside Recycling program! For a list of accepted materials, click here. To request a container if you did not receive one at the same time as your neighbors, click here. 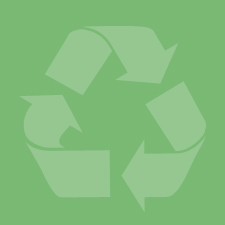 To find out more information about recycling, click here.